It's always great to see runway interpretations of head coverings, especially when they provide us hijabis with little style tips! 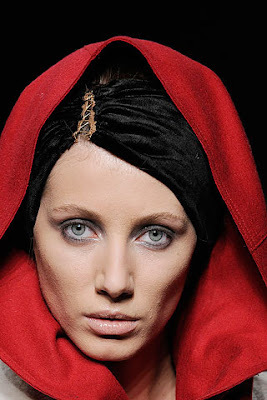 I love these loose hoods by Fendi, which look really classy draped over velvet headbands. And they're easy to adapt to hijab - just add a polo-neck top, and pin the hood to a bonnet cap underneath for full hair coverage. You could also try sliding in a pretty hair grip or clip into the cap to recreate this chic look. it's pretty! thank for sharing Jana. This is different and creative. Thanks for sharing. Salam Jana :) I'm loving this look, just wondering if you know where I can get hold of similar style velvet headbands. I love them - they look like Maharaja royalty! oh these look sooooooooooo cool! I love this look! It's very trendy and definitely spices up our head coverings. I have implemented this style before Fendi featured it. Although Fendi's portrayal is a bit formal, I myself used a cow-neck sweater and unfolded the neck part unto my head with an al-amira under piece underneath. It looked real hot with all black and accessorized it with color. Definitely very similar to Fendi's look. Love it! woww!!!!!!!!!!!!! love this blog very much!! interested to participate in Muslimah Style.huhu. I love that head coverings are going to be really popular this spring, you will see a lot of turbans, hijabs and scarves covering heads very soon!